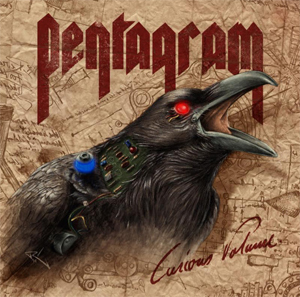 Doom metallers PENTAGRAM have reunited with Peaceville Records for its new studio album, entitled Curious Volume, which is scheduled for release on August 28th. Featuring 11 classic heavy metal compositions with catchy hooks from core band members Victor Griffin, Greg Turley and Bobby Liebling (Pete Campbell on the drums completes the band's lineup), the album was recorded with Swedish producer Mattias Nilsson at studios located in Maryland and Virginia. Additional recording took place in Tennessee with Grammy-Award-winning producer Travis Wyrick, who also produced PENTAGRAM's previous album, Last Rites. The album's cover artwork was provided courtesy of Richard Schouten. In support of the new album, the band has tours planned in North America and Europe throughout 2015/2016. Formed in the early 1970s with a debut album Relentless releasing in 1985, PENTAGRAM has survived through more than four decades filled with adversity and triumph to become the legendary international act it is today, firmly stamping its name into the heavy metal history books. Although once viewed as a cult act but with a strong and dedicated global fan base, PENTAGRAM has enjoyed a recent surge in popularity due in part to the 2011 documentary, Last Days Here, which follows the trials and tribulations of a troubled rock star, PENTAGRAM's lead singer Bobby Liebling. With a DVD release set for this fall on Peaceville's label, the documentary has garnered international recognition on the film festival circuit and has won several awards, including "Best Music Documentary" at the International Documentary Film Festival in Amsterdam. The band recently released its double DVD collection, All Your Sins, featuring over 7 hours of live footage spanning a period of three decades. Stay tuned for more information on PENTAGRAM and Curious Volume, out this August on Peaceville.